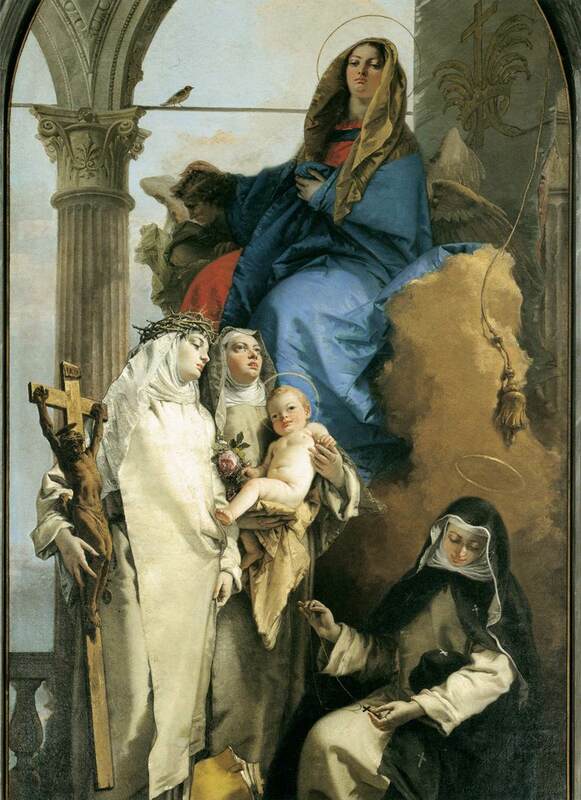 Infinite Art Tournament: Saint of the Month: St. Rose of Lima! Credentials: Canonized in 1671 by Pope Clement X.
Martyrdom: Self-infliction of a variety of penances, probably contributing to death by illness at age 31. Patron Saint of: South America, the Phillipines, Peru, Florists. Symbolism: Generally portrayed as a Dominican nun wearing a crown of roses, carrying roses, or being presented roses by Jesus or angels. Even the modest resources of my personal print library of hagiography (four volumes*) provides an interesting spectrum of ideas and attitudes about St. Rose of Lima. But to lay out the basics: she is, interestingly, of Lima. She was, in fact, the first person born in the Americas to be designated a saint. Her real name was Isabel de Flores y del Olivia, and there seem to be competing stories for why she came to be known as Rose. Her parents were well off, but lost everything in mining speculation. Rose subsequently helped support the family with needlework, but refused to marry and became a Dominican nun. St. Rose’s reputation for sanctity seems to be based on two separate personality traits. First, she is said to have been devoted to service to the poor and destitute of the Peru of her era, including slaves and Native Americans. Secondly and more emphatically, she apparently embraced an extreme asceticism and – how to put it – a desire to dissociate herself from her physical body. We are told that she wore a crown of thorns, and that she disfigured her face by rubbing it with hot peppers and her hands and arms by scalding them with lime, in order that her beauty would not lead anyone into carnal temptation. The prayer “Lord, increase my sufferings, and with them increase your love in my heart” is attributed to her. She died at the age of 31. We are told that in her adulthood she was shunned and persecuted, but also that she was widely revered as a holy woman within Lima; the two ideas contrast, but are certainly not mutually exclusive. St. Rose of Lima by Fernando Botero, b. 1932. The Penguin Dictionary of Saints (3rd Edition) discusses a kind of copycat saint, St. Mariana Paredes y Flores, who lived in Quito a generation after St. Rose, and notes with virtuosic caution that She and St. Rose… were simply seeking to follow Christ in his spirit and his sufferings: but the means were not always prudently chosen, and such saints pose delicate questions of religion and psychology. The Oxford Dictionary of Saints (4th Edition), with similar circumspection, notes that her long illness… seems to have had psychological as well as physical elements and speculates that perhaps her life is best understood as an attempt to make reparation for the widespread sin and corruption in contemporary society. Saints: A Visual Guide, finally, minimizes the issue with a little story of familial deception: she inflicted cruel punishments on herself, including wearing a crown of thorns, or spikes, which she concealed with a garland of roses lest she alarm her mother. Anonymous South American artist, late 1600s. In this engrossing new study, Frank Graziano uses the example of St. Rose to explore the meaning of female mysticism and the way in which saints are products of their cultures. Virginity, austerity, eucharistic devotion, incessant mortification, and mystical marriage to Christ characterized the devotional regimen that structured St. Rose's entire life. Many of her mystical practices echo the symptoms of such modern psychological disorders as masochism, depression, hysteria, and anorexia nervosa. Graziano offers a sophisticated argument not only for the origins and meaning of these behaviors in Rose's case, but also for the reason her culture venerated them as signs of sanctity. Interesting stuff, and from a quick skimming the first chapter it seems energetically written. I’ve added it to my to-read list, which makes it entirely possible I might read it someday. Or maybe not. My to-read list is already approaching what I might reasonably be expected to cover within my remaining life expectancy, and like distant galaxies in the expanding universe, seems to distend in such a way that items toward the back of the list get further away, even as I make plodding progress in their direction. 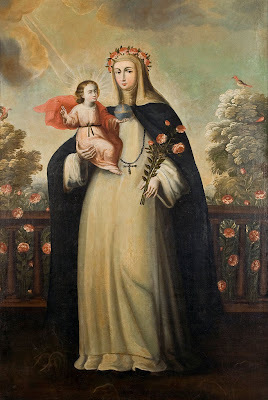 Anyway, I wish you a happy feast day of Saint Rose of Lima. I’m going to ask that you not celebrate with any cruel penances unless you have fully thought the matter through and have the support of at least three independent spiritual counselors. And perhaps not even then. Let’s face it: Saints are a Catholic thing. Only Catholics recite litanies of the saints. Only Catholics have patron saints. Only Catholics pray to the saints. This apparent ignorance of the very existence of the Orthodox branch of the Christian faith – with its, you know, ancient and robust traditions of veneration of the saints – really makes you wonder who the "Complete Idiot" referred to in the title is. Is it Paul L. Williams, Ph.D.? Or is it whoever made the decision to publish a book about saints by Paul L. Williams, Ph.D.? Neither, I think. 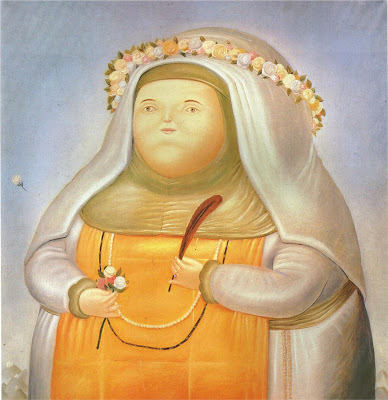 I think it is me, the guy who made the decision to purchase a book about saints by Paul L. Williams, Ph.D.
Botero's acute psychological study of a woman embracing extreme asceticism makes me think he'd be a good choice to illustrate the Complete Idiot's guide, should the idiots ever decide to pony up for illustrations. It did strike me that he filled her out a bit.